15% Off Car Seat Orders at Halfords Save 15% on baby seats and booster seats when you use this great code at Halfords. 20% Off Gold, silver and Bronze Bike Services at Halfords With Spring fast approaching and 20% off bike services now is the time to get your bike in tip-top condition! 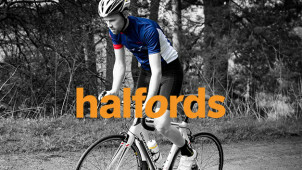 20% Off Selected Adult Bikes at Halfords Enjoy 20% off a great range of men's and women's bikes this Spring at Halfords. Free Next Day Delivery on Orders Over £40 at Halfords In a rush? You'll be on your bike in no time with free next delivery of orders over £40! 20% Off Selected Adult Bikes at Halfords In need of a new bike? Head over to Halfords for a great selection and 20% off! Discover 50% Off Camping Gear at Halfords - Airbeds, Stoves, Tents and More Get ready for your next camping adventure for up to 50% less when you shop at Halfords. 20% Off Selected Car Seats at Halfords Find the perfect car seat to keep your little safe and comfortable and save 20% when you shop at Halfords. 30% Off Selected Dash Cams at Halfords Find the right dash cam for you for 30% less when you shop at Halfords. Up to 30% Off Bike Racks Plus Extra 10% Off with Bike Orders at Halfords Wanting to go away with your brand new bike? Invest in a bike rack for your car for 10% less at Halfords! 20% Off Selected Sat Navs at Halfords Make getting from A to B a doddle with a Sat Nav from Halfords! Free Bike and Car Checks at Halfords Stay safe on the roads with a free car and bike check at Halfords. Halfords have been the reliable helping hand on the high street for over a decade. An expert retailer of car parts, enhancements, bicycles and camping and touring equipment, Halfords work hard to make sure all your trips are enjoyable. For cycling enthusiasts, Halfords stocks a huge range of bikes to suit your needs, so whether you’re looking for an off-road mountain bike, a folding commuter bike or anything in between - Halfords will be able to supply you with a quality bike and all the necessary safety accessories at a great value for money price. It doesn’t just stop at bicycles, Halfords have an extensive range of car parts and maintenance products to help you take care of your motor. Shop for mechanical tools, workshops materials, engine cleaner, car mats or batteries all in one place online, or for some advice you can visit the online help portal or an expert in-store to identify the products you need to keep your car running smoothly on the road. For services, MOTs and repairs, visit our Halfords Autocentre offers where you’ll find more savings on car maintenance costs. Beat the traffic, save the environment and get fit, with the Halfords Cycle2Work scheme. You’ll be amazed by how much you save on bus fares or petrol costs, and with a daily dose of regular exercise, you might even be able to save on your gym membership too. Discover how you can save on the cost of a new bike with Halfords Cycle2Work online today. Do Halfords do free delivery? Yes, when you spend over £40. This doesn’t apply to all items, so check the product’s page first. Where is my nearest Halfords? There are approximately 465 stores operating in the UK, so you won’t have to travel too far to find friendly advice and a shop-full of handy motoring and cycling essentials. Use the online Store Search by entering your postcode, city or town to find your nearest Halfords retailer with ease. Does Halfords price match items online? Not only do they pride themselves on their level of expertise, but Halfords are committed to providing their customers with great value for money. They regularly check competitor prices to make sure you’ll always pay the best price, just look out for the blue price match banner when you shop online. If you think you may have found an item cheaper somewhere else, take a look at their Price Match Promise to benefit from an extra saving today. How much is a Halfords bike service? Cyclists who regularly use the road will be familiar with the general wear and tear that comes with riding your bike day in and day out. The Halford Bike Care plans could be just what you need to prevent maintenance costs from wearing a hole in your pocket. From annual care plan to 3-year premium care plan, you’ll be able to find cover to ensure you receive repairs and servicing at no extra cost. Keep your bike running like clockwork when you buy a Halfords care plan today. Standard Delivery is free over £30 - arrives within 4 working days. Next Day Delivery is available for £4.99. Named Day Delivery is also available - £4.99 for weekdays, and £3.99 for weekends. Weekday Morning (£6.99), Afternoon (£6.99) and Evening (£9.99) delivery is also available. The size of your delivery can alter who your delivery is handled by - larger goods are handled by DPD and require a signature, for example. Certain bulky goods (for example tools chests) may also require a heavier delivery cost. Simply fill in your returns note and return all items as they arrived. Halfords offers a £7 courier service for larger items (simply get in touch), while returns for smaller items via the Post Office are at your own expense. You can also reach Halfords online via their contact form. Don’t let a breakdown derail your plans, keep moving with Halfords: the number 1 retailer for motoring and cycling in the UK. Both your car and your bicycle need regular maintenance, and whether you’re shopping around for car parts, sat navs, or a brand new bicycle, your local Halfords will never let you down. Don’t let costly vehicles run away with your money, and use a Halfords discount code to pay a better price on the bits and pieces you need. From roof racks to jump leads, you’ll find all the essentials you need to stay on the road for less at Halfords. Be equipped with all the necessary gear to enjoy your trips on the road, with Halford's camping, gear, outdoor gear and leisure essentials. It's always a great time to get outdoors and now packing up everything you need for a trip is affordable with us to lower the cost of your purchases. You’ll find towbars and trailers, roof boxes and bike racks, not to mention a bunch of outdoor clothing, tents and camping stoves. Keep your kids comfy in the car for your excursions when you choose a car seat from the road-tested selection at Halfords. They offer free car fitting and an expert safety check, so you'll drive away with confidence. Avoid the temptation to scrimp on costly car seats, and use a Halfords promo code to find a better deal on the ultimate essentials to make your motor safe for your children. You’ll have the pick of top brands including Britax, Joie, Maxi-Cosi and much more, all available at fantastic prices when you shop with vouchercloud today.